Medium tank – Small number of unfinished hulls and turrets. At least one F/G hybrid. 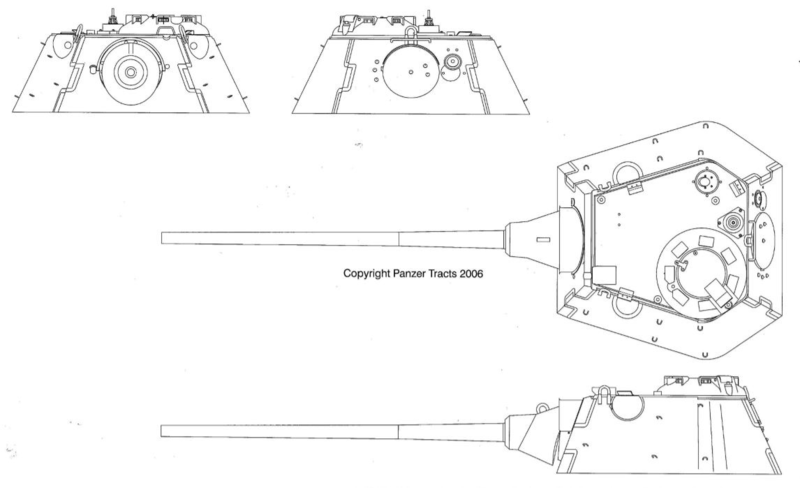 As early as 1943, the Germans sought to design a new turret for the Panzerkampfwagen V Panther (Sd.Kfz.171). 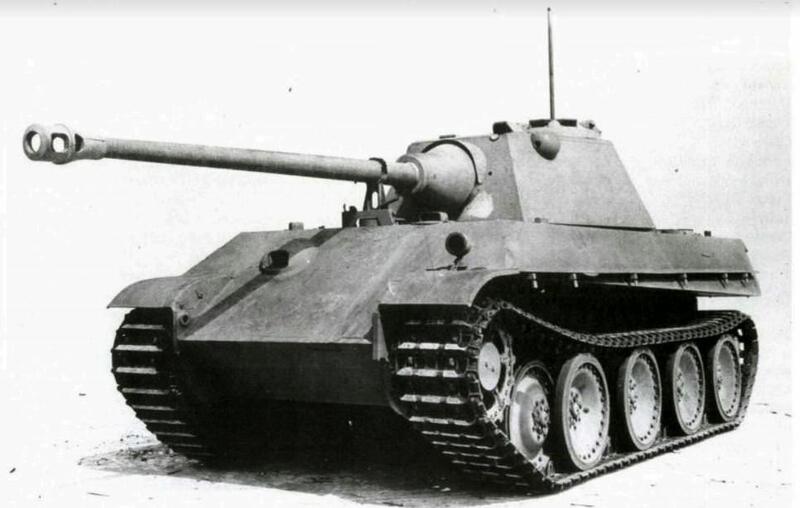 The Rheinmetall-designed turret that the Panther was equipped with was considered to be an inefficient design with various flaws. Wa Prüf 6, a department of the Waffenamt tasked with designing and testing armored vehicles, presumably thought that Rheinmetall could redeem themselves by redesigning the new turret. 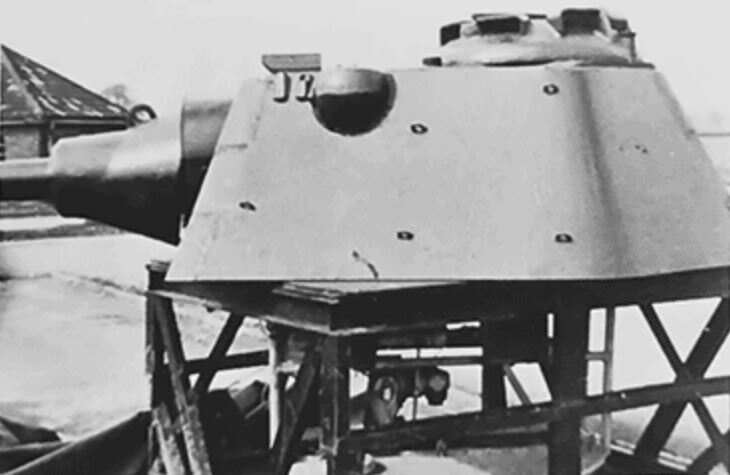 Wa Prüf 6 required that the new turret was to have a smaller visible frontal area, elimination or reduction of the mantlet’s shot trap from the original Panther turret (which tended to deflect rounds into the hull), increase in armor protection, and internally mount a stereoscopic rangefinder, while weighing no more than the original Panther turret. 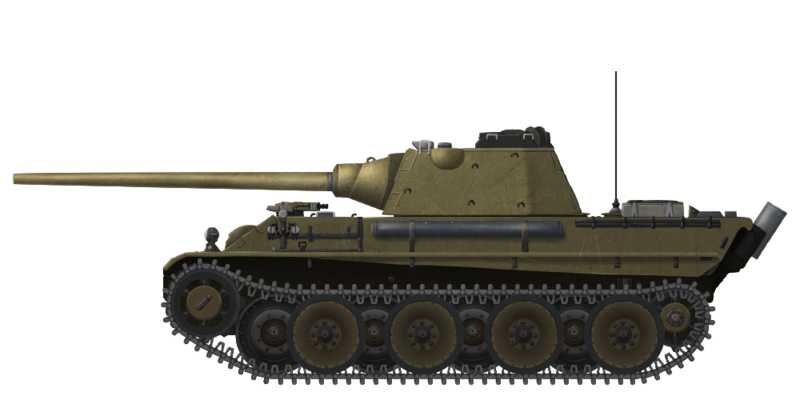 On March 1, 1943, Rheinmetall created conceptual turret design drawing, H-Sk 88517, otherwise known as the ‘Turm-Panther (schmale Blende)’ (English: ‘Turret-Panther (narrow mantlet)’) under these requirements. 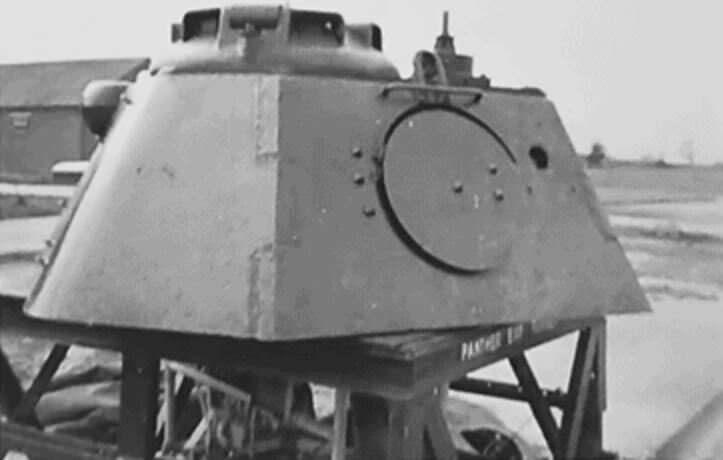 The stereoscopic rangefinder was able to be accommodated by creating a significant bulge at the top of the turret. In addition, a periscopic gun sight was considered over a standard telescopic gun sight. The frontal turret armor had a thickness of 120mm set at an angle of 12 degrees, a thickness of 60mm at the sides and rear set at an angle of 25 degrees, and a thickness of 40mm set at an angle of 17 and 7 degrees on the turret roof. With these changes in mind, everything else was to be the same as the Panzerkampfwagen Panther Ausf. A’s turret. The schmale Blende seems to be some sort of adaption of Rheinmetall’s H-SKA 86176 otherwise known as ‘Turm Panther 2 (schmale Blendenausführung)’ (English: ‘Turret Panther 2 (narrow mantlet variant)’) which the drawing dates back to November 7, 1943. 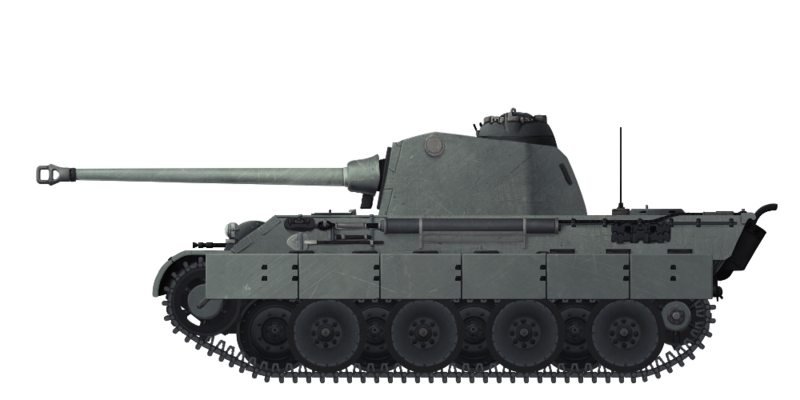 The turret served as one of several proposals for the Panzerkampfwagen Panther II. It lacked the triangular roof line which accommodated the rangefinder, the rangefinder itself, and the armored guard underneath the mantlet which was designed to prevent shot traps. 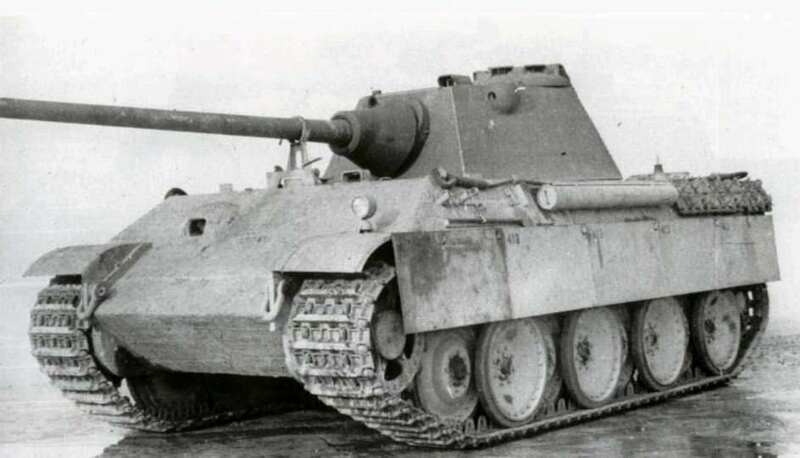 It is unclear if the schmale Blende is a parallel development to schmale Blendenausführung or a way for Rheinmetall to salvage the design after the cancellation of the Panzerkampfwagen Panther II in May, 1944. Wa Prüf 6 was dissatisfied with Rheinmetall’s design for reasons unknown and, thus, in Spring of 1944, they handed the responsibility over to Daimler-Benz. Wa Prüf 6 gave a new set of requirements, most of which were the same as the original. The exceptions were exchanging the co-axial M.G.34 with the M.G.42, minimizing of the production cost, ability to be quickly converted into a Befehlswagen Panther (commander’s tank version of the Panther), and ability to use infrared night vision equipment. 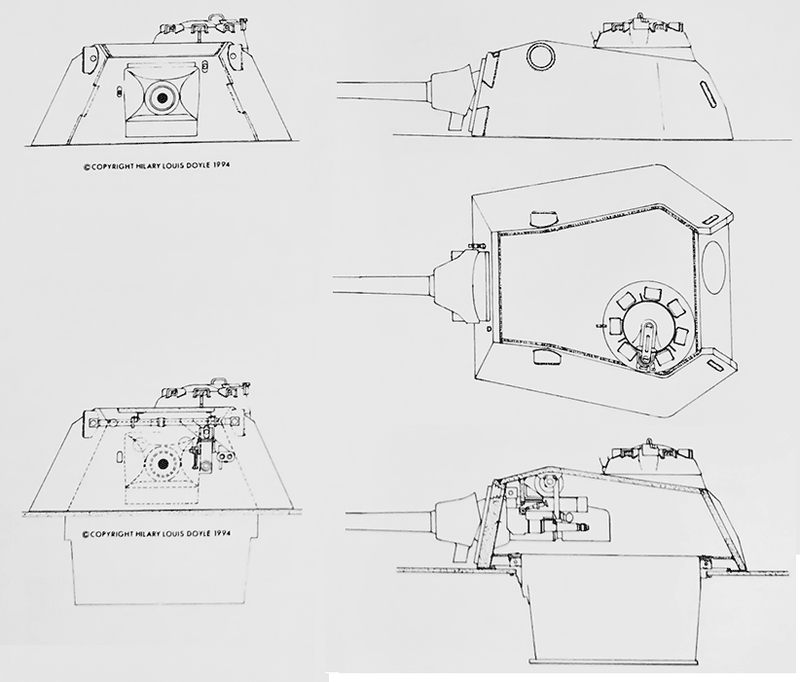 Under these new specifications, the Schmalturm (English: ‘narrow turret’) was born. It did everything it was required to do and then some. It weighed less than the original Panther turret (from 7665 kg to 7565 kg) and made the area of the frontal armor smaller while not affecting the internal crew space. It also reduced the production time by about 30-40%. The new turret shared little to no relation to the original Panther turret, unlike its Rheinmetall predecessor. It was then decided that the genesis of the Panzerkampfwagen Panther Ausführung F (Sd.Kfz.171) would be determined by mounting the Schmalturm on a slightly modified Pz.Kpfw. Panther Ausf. G hull. Several Schmalturm prototypes, dubbed ‘Versuchs-Schmalturm’ (English: ‘experimental narrow turret’), are known to have been built for Wa Prüf 6. These were essentially experimental Schmalturm turrets on a Pz.Kpfw. Panther Ausf. G hull, effectively making them Pz.Kpfw. Panther Ausf. F prototypes. The first Versuchs-Schmalturm, completed by August 20, 1944. It was mounted on Pz.Kpfw. Panther Ausf. G chassis number 120413, which was built by M.A.N. and was originally intended for combat. The chassis was instead used as a test bed. 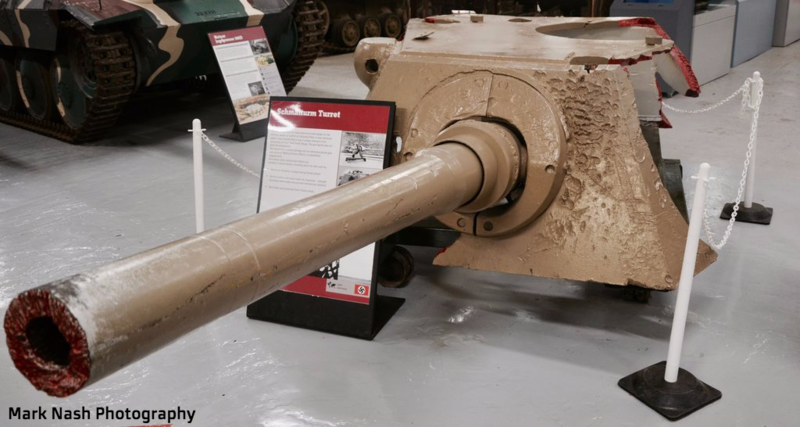 It featured a loader’s periscope on the turret roof which ended up being removed and the hole left from the installation was filled with a welded armor plug. A hole at the front of the turret was created for a telescopic gun sight, presumably a monocular version of the articulating T.Z.F.13 gun sight and an unspecified periscopic gun sight. ‘T.Z.F.’ stood for ‘Turmzielfernrohr’ (English: ‘turret gun sight’). 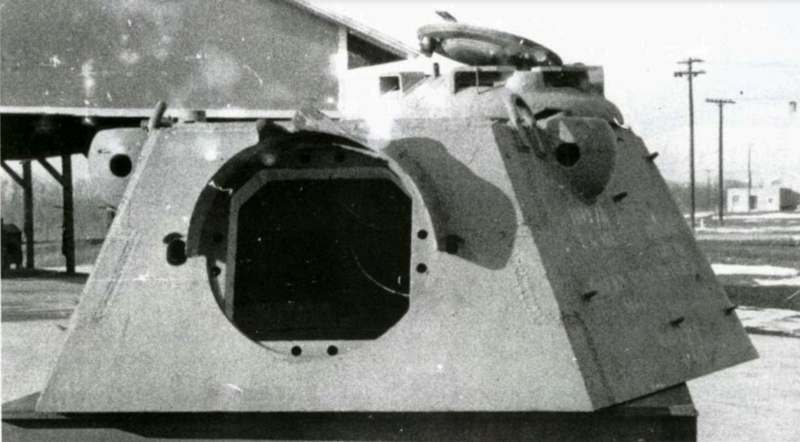 The redesigned cupola had a hole to extend a T.S.R.1 observation periscope without opening the hatch. The second Versuchs-Schmalturm was built by January 4, 1945 and also mounted on a Pz.Kpfw. Panther Ausf. G, chassis number 120413 (according to a different source), which might suggest that the same chassis was used for both Versuchs-Schmalturm turrets. The new turret featured a S.Z.F.1 stabilized periscopic gun sight, but no hole for a telescopic gun sight. The hull was also photographed with ‘Schürzen’ side skirts and with the rain and debris guard band on top of the mantlet omitted. The muzzle brake was most likely omitted on this iteration. One of the defining features of the Pz.Kpfw. Panther Ausf. F was the inclusion of a rangefinder. The E.M.1.32 m stereoscopic rangefinder was under development by Zeiss of Jena, Germany. ‘E.M.’ is an acronym for Entfernungsmesser (English: ‘rangefinder’) and ‘1.32 m’ stood for the length of the rangefinder. It has a magnification of 15x and a field of view of four degrees. However, no example of this rangefinder would ever be built. Development would end in April of 1945 and mass production was meant to begin in July of 1945. In order to accommodate the rangefinder, it was located near the front top of the Schmalturm. Two spherical bulges were created to properly accommodate the piece of equipment on both upper front sides of the turret. Initially, the monocular, articulated telescopic T.Z.F.13 was the intended gun sight for the Pz.Kpfw. Panther Ausf F, developed by Leitz of Wetzlar, Germany. An aperture at the front of the turret would need to be created to accommodate the sight, a feature that the first Versuchs-Schmalturm possessed. The T.Z.F.13 had a selectable magnification of 2.5x and a field of view of 28 degrees and 6x with a field of view of 12 degrees. An order of 4208 T.Z.F.13 gun sights was placed from Leitz which only ended with the dismal production of two gun sights, one in October of 1944 and the other in January of 1945. It appears that the T.Z.F.13 and S.Z.F.1 gun sights were going to compliment each other with S.Z.F.1 acting as a supplement. 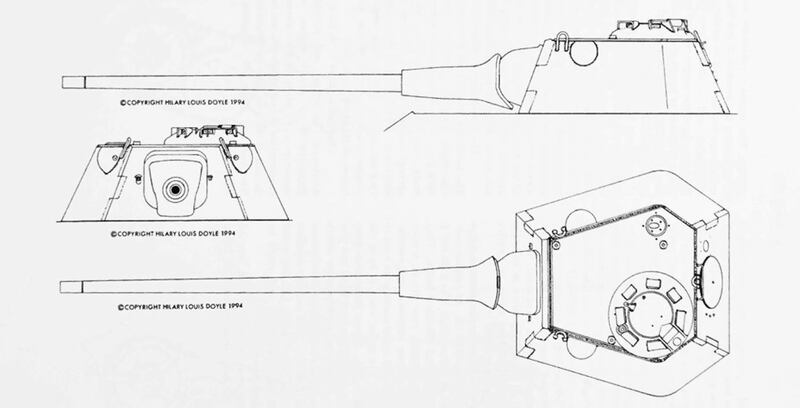 However, the S.Z.F.1 ended up being chosen, seeing as a periscopic stabilized device was desired for series production of the Schmalturm turret. Ten trial series S.Z.F.1s were ordered from Leitz in 1944 which seemed to have resulted in the production of five examples from September to December, 1944. One thousand more production versions were ordered in January of 1945. Meanwhile, four S.Z.F.1b modified gun sights were produced in January and February 1945. 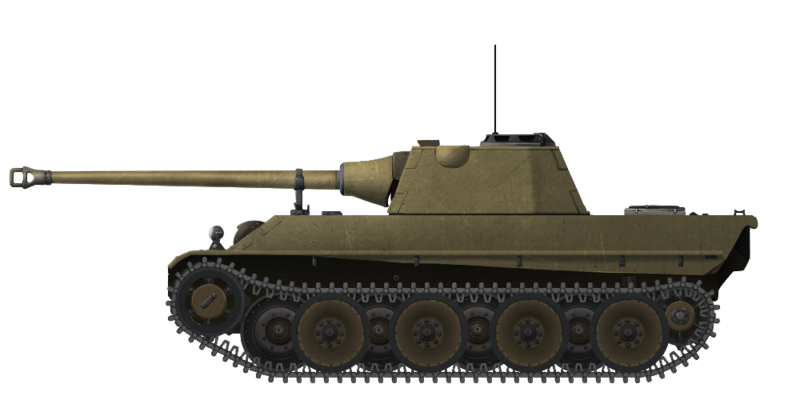 According to the President of the Panzer Kommission Stiele von Heydekampf, they became interested in stabilizing both guns and gun sights after the discovery of the Medium Tank, M3’s stabilizers during the North Africa Campaign. Heydekampf claimed that they had managed to build an experimental gun and gun sight stabilizers for the Panzerkampfwagen V Panther. However, he refused to give any additional details other than claim that the experiments were promising. The optical parts of the S.Z.F.1 sight were built by Leitz of Weltzar, but the gyroscopic parts for vertically stabilizing the sight were provided by Fa. Kreiselgerate of Berlin. Ernst Haas from the Berlin firm was credited as the inventor and designer. Haas claims that he invented the equipment prior to the Second World War and offered his patents to the American Sperry Gyroscope Company. The company offered him too little for his patents and thus Haas refused their offer. However, his claims contradict the claims of Ludwig Leitz, head of development at Leitz. A less refined sight similar to the S.Z.F.1 sight was found in the Leitz plant. Ludwig Leitz claims that the sight was captured on the Eastern Front. He also goes on to claims that the sight was being refined and copied by both Leitz and Kreiselgerate together. The original precursor to the S.Z.F.1 sight lacked the ability to fire accurately while on the move. While the sight was stabilized in the vertical plane, the gun was not. This meant that one could easily use the sight for observation, but could not be used to accurately fire while the vehicle was moving. However, the inclusion of a “pre-ignition device”, as Haas called it, allowed it to fire with a degree of accuracy while the vehicle was moving. The “pre-ignition device” was, in reality, a gyroscopic rate-of-turn indicator which measured the rate of angular motion in the vertical plane. With this device, when the unstabilized gun and stabilized gun sight aligned at the right moment when moving, the gun would fire after the gunner has triggered the firing of the gun. There would thus be a delay until the gun and sight align. This effectively gave the tank the ability to fire accurately while driving albeit only when the inconsistent alignment occurred. The S.Z.F.1 periscopic sight consists of the periscope, control box, and motor generator. The control box sits at a “comfortable” proximity to the gunner. 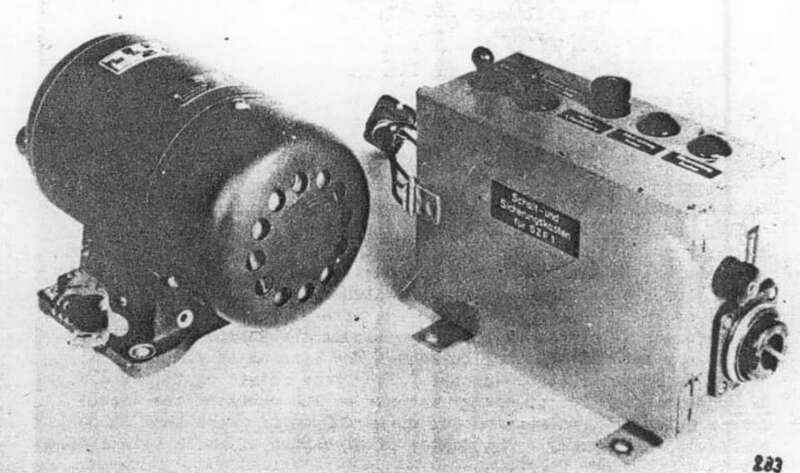 It features switches for correcting the optical sighting axis by elevating or lowering it, for power supply, lighting, and firing, and for the “arresting device”. The sight had a magnification of 3x and 6x with “clean” observation up to 6000 m, elevation/depression of ±18, and the gyros rotated at 28000 RPM. The device consumed 120 watts on the direct current side. The S.Z.F.1 was seen as a very rugged and sturdy design which “works without the least failure” even beyond the elevation of the sight because of the “good arrangements of the gyros”. Trials showed a mean value of 10 rounds which each deviated ±0.5 m from a target 1000 meters away, which corresponded with the angular value of 0.5 milliradians. 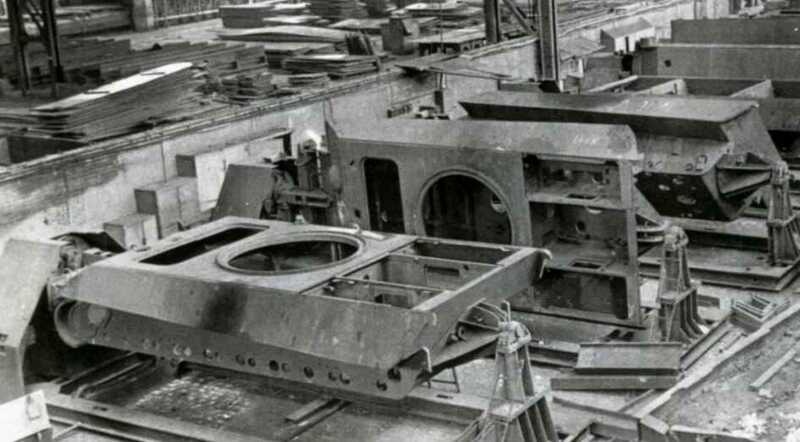 The loader’s periscope from the previous Panther turrets was carried over to the first Versuchs-Schmalturm and production Schmalturm turrets. However, a design change omitting the loader’s periscope occurred after production of the Schmalturm turret commenced. The hole for the loader’s periscope was plugged by a welded armor plug. Compared to the earlier Panther cupolas, the Pz.Kpfw. Panther Ausf. F tank’s cast cupola was lower in height and, as a result, presented a smaller target. It featured seven slots for easily replaceable watertight and bullet resistant periscopes. A traversable ring was mounted internally at the top of the cupola, where a V-shaped rangefinder, scissor telescope, FG 1250 infrared night vision device (of which can be screwed on easily), and an anti-aircraft machine gun mount could be mounted. Internally, a cupola azimuth indicator was located near the bottom of the cupola. The azimuth indicator showed the commander and the gunner the relative position of the turret to the hull and consisted of a “clock dial drive”, comprised of ring connected via a gear train to the turret. The Pz.Kpfw. Panther Ausf. F featured overall improved armor on the turret and even the hull (although to a lesser extent) compared to previous Panthers. The armor plates were made from E22 alloy. Armor plates that ranged from 16-30mm thick had a Brinell hardness of 309 to 353, 278-324 for 35-50mm plates, and 265-309 for 55-80mm plates. Armor plate thickness were allowed to deviate 0% to 5% from the intended specifications. The cast armor portions were made from alloy ‘B’ and had a Brinell hardness of 220 to 336. Brinell scale is a standardized method of characterizing the hardness of a certain material. 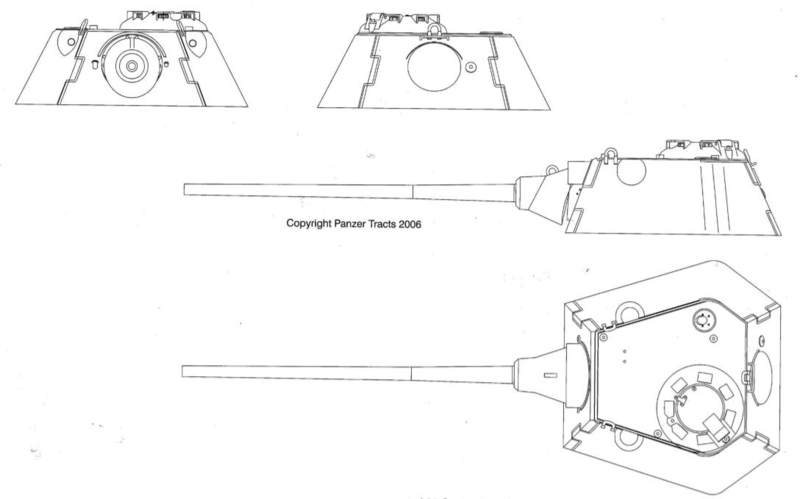 The frontal turret armor plate thickness consisted of 120mm at 20 degrees, 60mm on the sides and rear at 25 degrees, 40mm flat on the roof, and 150mm of cast armor on the ‘Saukopf’ (English: pig’s head) style mantlet. The hull’s armor was largely the same as the Ausf G, with the differences lying on the hull’s roof. With the hull’s armor being entirely made out of armor plating, the frontal upper glacis plate consisted of 80mm thick plate at 55 degrees, 50mm at 55 degrees for the frontal lower glacis, 50mm at 29 degrees for the upper side hull, 40mm vertically flat for the lower side hull, 40mm at 30 degrees at the rear, 40-25mm horizontally flat for the hull roof (compared to the Ausf G’s 40-16mm), 16mm horizontally flat on the engine deck, 16mm horizontally flat on the panniers (plate protecting the bottom of the hull superstructure overhang above the tracks), 25mm flat at the frontward belly, and 16mm horizontally flat at the rearward belly. The Pz.Kpfw. Panther Ausf. F was equipped with a Nahverteidigungswaffe (English: close defense weapon). The Nahverteidigungswaffe consisted of a circular plate bolted down with a 92mm launch tube angled at 39 degrees. It primarily fired Schnellnebelkerze 39 (English: ‘quick smokescreen’) smoke candles for concealment. The new ventilator’s position for the fighting compartment made it more economic in armor parts. 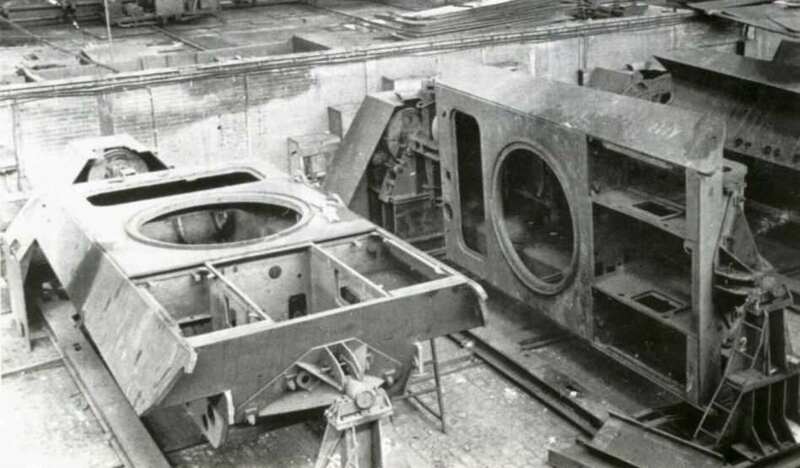 The ventilator was now mounted on the right front of the turret reinforcement ring and the ventilator’s fan also saw use as an extractor of fumes from firing the gun. Greater efficiency was gained by swapping the flexible ducting from the previous Panthers with a thin metal tubing. The Panzerkampfwagen Panther Ausf. F tank’s main armament consisted of the 7.5cm Kw.K.44/1 L/70 developed by Skodawerke of Pilsen, Protektorat Böhmen und Mähren (English: ‘Protectorate of Bohemia and Moravia’) (German-occupied Czechoslovakia), with the assistance of Krupp. 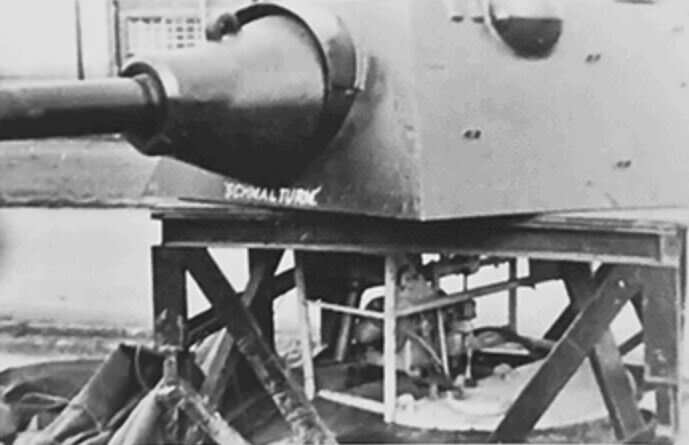 The gun was essentially a 7.5cm Kw.K.42 L/70, but modified to be more compact by placing the buffer and recuperator below the gun instead of either side as on the 7.5cm Kw.K.42 L/70. The gun cradle was now welded and the air compressor set for the fume extractor was now replaced by an air pump cylinder by surrounding the recuperator with a single additional cylinder. The air pump cylinder activated once 420mm of recoil was reached. The muzzle brake was removed which caused the recoil force to increase from 12 to 18 tonnes, however, this omission was probably necessary to reach the 420mm of recoil. Few early 7.5cm Kw.K.44/1 L/70s were fitted with muzzle brakes and an example can be seen on the first Versuchs-Schmalturm. The Kw.K.44/1 weighed 1920 kg and had a muzzle kinetic energy of 285 tonnes. The 7.5cm Kw.K.44/2 L/70 was a further development of the 7.5cm Kw.K.44/1 L/70. Essentially, it was a Kw.K.44/1 with a mechanical rapid reload device weighing 3400 kg with the gun. The device consisted of a large structure to the right of the gun carriage which held 4 rounds This device, when activated by the recoil of the gun, would lift up a round onto a holder at the end of a pivoting arm. After the breech opened and ejected the spent casing, it stayed open and the holder would move downwards and a tension spring guide would insert the round into the breech. The breech would then close automatically which resulted in the release of pressure for the pivot arm spring which brought the holder back into a position to accept another round. When the gun fired the newly inserted round, the tension spring guide would reset and thus the process repeated. Three examples of the 7.5cm Kw.K.44/2 L/70 were built and sent to Unterlüß, Germany at the Rheinmetall-Borsig test range. The device gave the gun an impressive rate of fire of 40 rounds per minute albeit with only four rounds to fire. However, it would take a significant amount of space in the Schmalturm. Nevertheless, steps were taken to mount it in the Pz.Kpfw. Panther Ausf. F.
All 82 rounds were stored in the hull, likely in the same fashion as the Pz.Kpfw. Panther Ausf. G. carrying mostly Pzgr.39 (APCBC), Sprgr. (HE), and possibly a few Pzgr.40 (APCR) shells. Due to the cancellation of production of the armored M.G.34, the M.G.42 was chosen as the replacement for the coaxial machine gun. A new mounting was designed in order to receive the M.G.42. The mounting was attached to the gun cradle and comprised of a front support with locking clamps, rear support, recoil spring, and a mechanism to adjust the gun. Two ammunition bags were positioned below the mounting. One for live ammunition and the other for spent casings. On the rear turret plate, a pistol port was created in order to defend against enemy soldiers from climbing over the rear of the vehicle. In addition, the M.G.34 bow machine gun for the radio operator was replaced by a St.G.44. Most if not all the automotives of the Panzerkampfwagen Panther Ausf. F were the same as on the Panzerkampfwagen Panther Ausf. G.
The Panzerkampfwagen Panther Ausf. F was propelled by a V12, watercooled, Maybach HL 230 P30 engine generating 600 hp @ 2500 rpm. The Pz.Kpfw. Panther Ausf. F had a combat weight of 45.5 tonnes which gave it a power-to-weight ratio of 13.2 horsepower per tonne. Coupled with a ZF A.K.7/200 transmission (located at the front), the Pz.Kpfw. Panther Ausf. F could reach 3.4 km/h in the first gear, 6.8 km/h in the second gear, 10.9 km/h in the third gear, 17 km/h in the fourth gear, 24.6 km/h in the fifth gear, 34.7 km/h in the sixth gear, 45.8 km/h in the seventh gear, and 3.3 km/h in the reverse gear. It had a maximum speed of 46 km/h, average road speed of 30-35 km/h, and a cross country speed of 20 km/h. It carried 700 liters of fuel which gave it a range of 200 km on road and 100 km on cross country. The Pz.Kpfw. Panther Ausf. F was 8.86 m long (with gun), 6.866 m long (without gun), 3.42 m wide (with Schürzen, and 2.917 m tall. It had a ground pressure of 0.88 kg/cm^2, could climb slopes of 35 degrees, a ground clearance of 540mm, was able to ford depths of up to 1.9 m, could climb steps of up to 900mm, and cross trenches of up to 2.45 m wide. It also had a steering radius of 9.4 m and a steering ratio of 1.5. The suspension consisted of 8 overlapping road wheels on each side with 860/100 rubber tires connected to torsion bars. The drive sprockets were located at the front and the idler wheels at the rear. Eighty-seven dry pin Kgs 64/660/150 track links were located on both sides. ‘Kgs’ is code used to describe the characteristics of the tracks. ‘K’ stands for ‘rapid tracks for vehicles’, ‘g’ stands for ‘cast steel all alloys’, and ‘s’ stands for ‘floating pins’. ‘64’ stands for the design of the track, ‘660’ stands for the width of the tracks in millimeters, and ‘150’ stands for the pitch of tracks in millimeters. Illustration of the Panzerkampfwagen Panther Ausf. F (Sd.Kfz.171). Illustration of the Panzerkampfwagen Panther Ausf. G (Sd.Kfz.171) mounting the first Versuchs-Schmalturm. Panzerkampfwagen Panther Ausf. A (Sd.Kfz.171) equipped with Rheinmetall’s schmale Blende. These three illustrations are by Andrei ‘Octo10’ Kirushkin, funded by our Patron Golum through our Patreon Campaign. 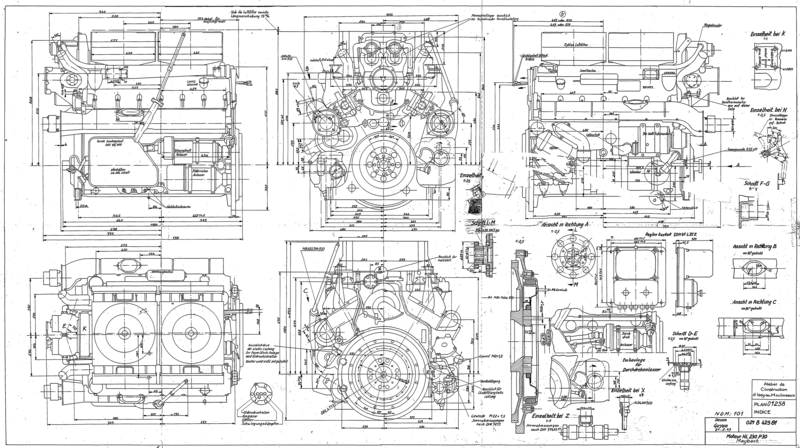 Maybach HL 230 P30 engine schematics. 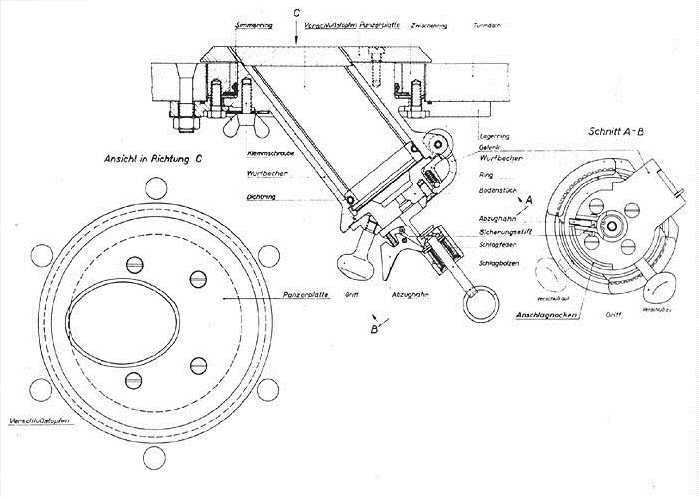 The new turret traverse gear developed by Daimler-Benz of Berlin-Marienfelde, Germany dropped two differentials and the multiplate overload clutch from previous Panthers. This resulted in it being cheaper, lighter, and smaller. The traverse gear was fixed in place to the turret ring and “driven from the main transmission shaft through a hydraulic motor”. The hydraulic motor developed by Böhringer GmbH produced 6 hp at 800-4200 rpm. Normal turret traverse and precise horizontal gun sight aiming were both done by the hydraulic motor. Accurate control of the turret traverse, instead of the gunner’s feet as on previous Panther variants, was now done by hand. In addition to the gunner, the commander was also able to directly manipulate the turret traverse because of a linkage to the hydraulic motor. However, the commander wasn’t able to precisely traverse the turret needed for good aiming of the gun. The maximum 360 degrees turret traverse time via hydraulic power was 30 seconds. Traversing the turret by hand took four minutes for a full 360-degree traverse. One full turn of the handwheel equaled 0.405 degrees of turret traverse. If the tank were to tilt to one side, the loader had an auxiliary turret traverse handwheel to help the gunner traverse the turret. Elevating the main gun and coaxial machine gun was also made lighter, cheaper, and more compact with the new elevation mechanism. The mechanism consisted of a screw and nut which were connected by universal joints from the turret turntable to one end and the other end of the gun cradle. Elevating the gun was done by a handwheel on the turret traverse gearbox casing which used a carden shaft and beveling gear to connect to the screw and nut mechanism. To dampen shocks from the movement of the vehicle, a ring spring was installed. The gun was able to elevate up to 20 degrees and depress down to 8 degrees. A full rotation of the hand wheel equated to 4 degrees of elevation. The Panzerkampfwagen Panther Ausf. F carried over the five-man crew, three in the turret and two in the hull. In the hull, the driver was seated on the left front and the right radio operator was located on the right next to the driver with the St.G.44 hull machine gun under his control. In the turret, the gunner sat to the right of the gun and the loader on the left. The commander was located behind the gunner. The deep groove type turret ball race had the same internal diameter as the previous Panther turret. Additionally, instead of being separate as on previous Panthers, the inner race was integral with the traversing rack. The turret basket was connected to the inner turret ball race which used a tubular frame to connect with the turret floor. The tubular frame carried the hydraulic turret traverse motor, gun elevating gear, and a compartment for spent cartridge casings. 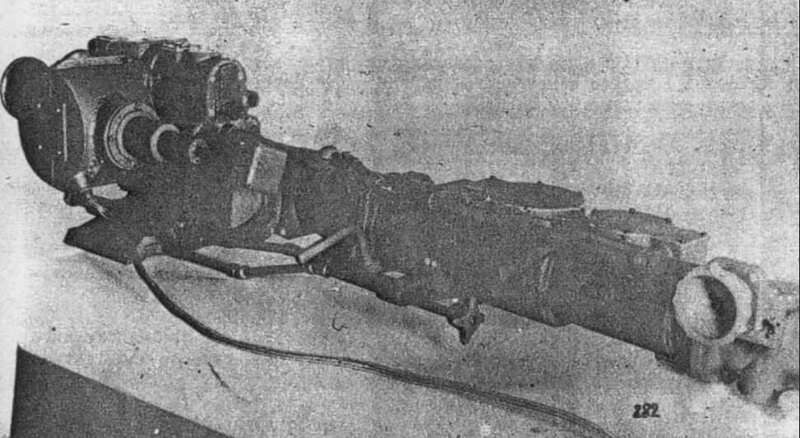 Removable and adjustable leather cushioned with “rubber hair filler” seats for the gunner and loader were mounted on upper left and upper longerons (longitudinal bar added to provide rigidity), respectively. 20 “belt sacks” on the longeron, a container for a spare M.G.42 barrel, two containers for breathing tubes, and a container for a spare periscope are located in the turret basket. The rest of the equipment was put away behind a guard on the turret reinforcement ring. For communication between vehicles, the Fu 2 and Fu 5 intercoms were used. Other changes include modification of the driver’s periscope mount and new hatches for the driver and radio operator. 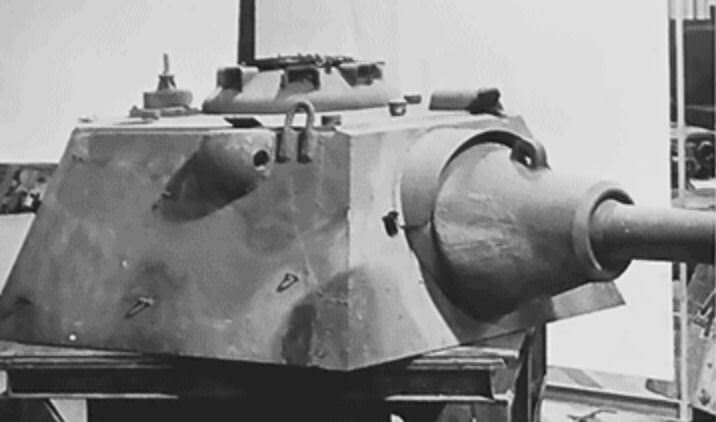 In order to open the new hatches, the hatch would be raised slightly and “move to the side”, presumably as opposed to swiveling away as on previous Panther iterations. A Befehlswagen Panther configuration could be easily achieved by personnel in the field. The FuG5 ultra-short wave radio set was mounted on the hull and the Fu 8 long range radio was mounted in the turret. An armored encasement besides the cupola located on top of the turret shields the insulator below the antenna for the Fu 8 radio. There were two types of methods the upper front plate and side plate interlocked with each other on the Pz.Kpfw. Panther Ausf F. The side hull plate interlocked with the front hull plate in two different methods. 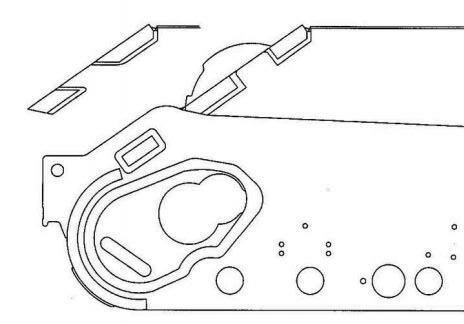 The side plate either locked with the front plate perpendicularly or horizontally. The rear turret escape hatch was made out of the leftovers from cutting the rear turret plate. Production of the Pz.Kpfw. Panther Ausf. F was to start in early 1945 and done by Krupp-Gruson in April, M.A.N. in April, Daimler-Benz in March, M.N.H. in May, and Nibelungenwerk in April. To Krupp-Gruson and Nibelungenwerk, the Pz.Kpfw. Panther Ausf. F was to be their first Panthers produced while for M.A.N. production would have started with Panther number 2229, Daimler-Benz with Panther number 2621, and M.N.H. with Panther number 2303. The sought after production goal of all the German firms combined was 2,940 Pz.Kpfw. Panther Ausf. Fs in 1945. Most of the firms were to share the production load about equally together with Krupp-Gruson and initially Nibelungenwerk doing the least, presumably due to their lack of experience in building Panthers. Due to numerous delays and setbacks, the planned production schedule was never achieved. Krupp-Gruson was to build their first two Panthers in May and Nibelungenwerk was to build their first two Panthers in August. According to M.A.N. representatives, M.A.N. was unable to finish any Pz.Kpfw. Panther Ausf. Fs, although they claim that Daimler-Benz was able to finish a Pz.Kpfw. Panther Ausf. F chassis outfitted with a Pz.Kpfw. Panther Ausf. G turret and “steel tire, rubber cushioned” road wheels. Even if the turret ring sizes were the same between the Ausf. G and Ausf F, significant changes were going to be needed in order to mount an Ausf. G turret on an Ausf. F hull as the turret race and turret traverse gear were incompatible. It seems that only a few Pz.Kpfw. Panther Ausf F. hulls were completed with a couple of mostly finished Schmalturm turrets (although they lacked some essential equipment such as the gun sights and range finder). Some Schmalturm examples were captured and sent to the United States, specifically the Aberdeen Proving Ground and the United Kingdom for analyzation. The Panzerkampfwagen Panther Ausf. F, in its completed state, never saw service as the turrets were never completed. If a few Pz.Kpfw. Panther Ausf F. managed to be completed by 20-23 of April 1945, they would have immediately seen combat defending Berlin with the II Abteilung/Panzer Regiment 2 (2nd battalion of the 2nd Panzer Regiment). However, at least one Pz.Kpfw. Panther Ausf. F mounting a Pz.Kpfw. 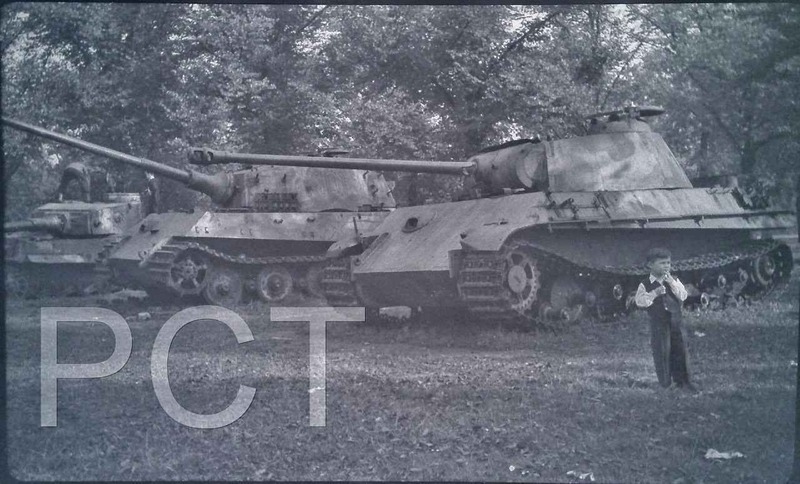 Panther Ausf G. turret was seen defending Berlin in 1945 and subsequently moved into some sort of tank dump next to a Tiger I and Tiger II. This is most likely the Daimler-Benz-made Pz.Kpfw. Panther F/G hybrid M.A.N. representatives mentioned. Three different images of the same Pz.Kpfw. 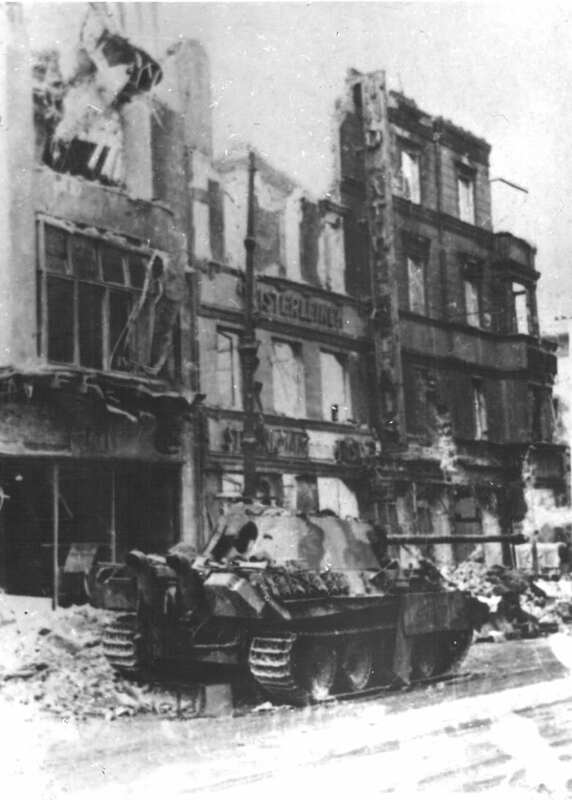 Ausf F/G hybrid knocked out in Berlin. It seems to have been knocked out from a round hitting the barrel near the mantlet, fracturing the barrel, and thus being abandoned by its crew. The hull was identified as Ausf. F hull by examining the interlocking plates. The side superstructure plate interlocks with the front upper plate horizontally, which means it is a Pz.Kpfw. Panther Ausf. F hull. The Panzerkampfwagen Panther Ausf. F was the right upgrade at the wrong time. The Schmalturm was a significant improvement over the previous turret, however, it was far too late. By the time the vehicle entered production, Germany’s fate was sealed. The Allies were closing in and by the time they reached the Pz.Kpfw. Panther Ausf. 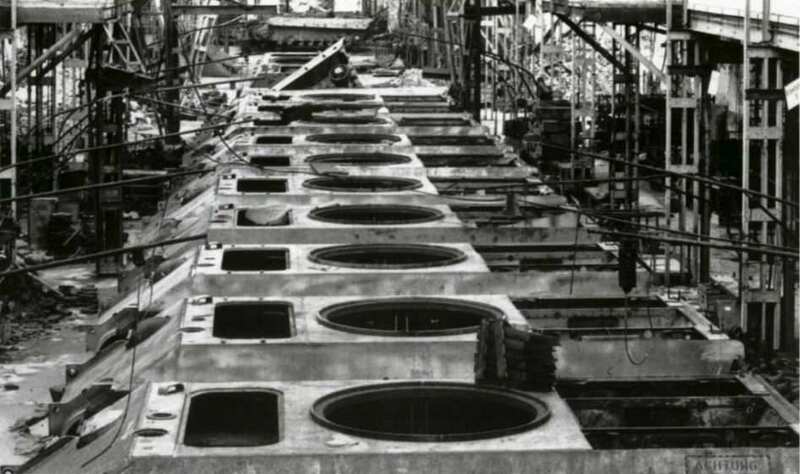 F’s production facilities, what they found were a couple of unfinished hulls and turrets. What is left of the Pz.Kpfw. Panther Ausf. F is a fractured Schmalturm that was used as a range target at The Tank Museum, Bovington. It is important to note that the designations, ‘Panzerkampfwagen V Panther’ and ‘Panzerkampfwagen Panther’ are both correct for the same family of vehicles. 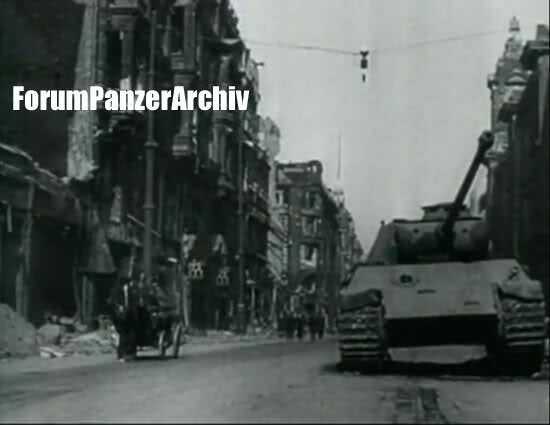 It is also important to note that the designation ‘Panzerkampfwagen V Panther’ did not receive an Ausführung letter modifier, however ‘Panzerkampfwagen Panther’ did. For example, it is incorrect to say ‘Panzerkampfwagen V Panther Ausf. G’ (or any other Ausführung letter modifier). On the other hand, it is correct to say ‘Panzerkampfwagen Panther Ausf. G’. Jentz, T.L. 1995. 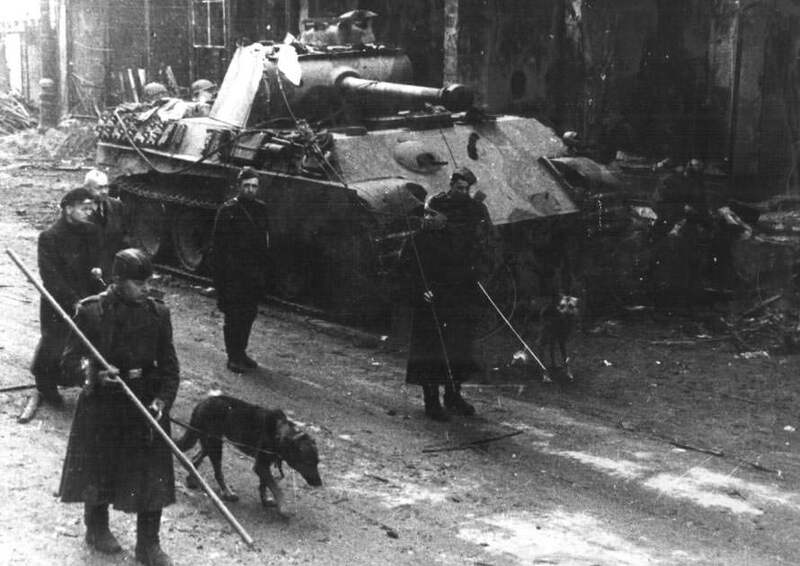 Germany’s Panther Tank: The Quest for Combat Supremacy. 1st ed. Atglen, Pennsylvania: Schiffer Publishing Ltd.
Spielberger, W.J. 1993. Panther & Its Variants. 1st ed. Atglen, Pennsylvania: Schiffer Military/Aviation History. The Custermen Division. 2001. Nahverteidigungswaffe. http://www.custermen.net/nahvert/nah.htm Date of access: 6 Feb. 2018. The author would like to extend his gratitude to Harold Biondo for providing sources. Definitely, we are always looking out for possible articles that may not be about armored vehicles themselves.